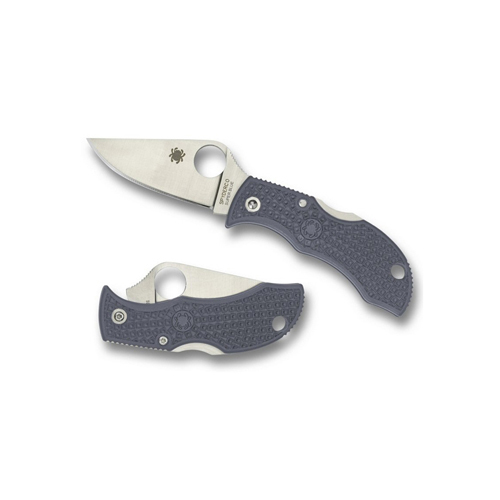 Spyderco Sprint Run blends the exceptional functionality and convenience of the Manbug with the incredible cutting performance and edge retention of Super Blue steel. Manufactured by Hitachi Metals Ltd. of Japan, Aogami Super Blue is the pinnacle of Hitachi’s three premium-grade high-carbon steels. It combines the same superior quality iron sand used to craft legendary Japanese swords with high-tech alloys to create a steel capable of extreme sharpness and edge retention. The Manbug Super Blue’s blade consists of a Super Blue core forge welded between two layers of 420J1 stainless steel that protect the core and increase the blade’s strength. Full-flat ground for exceptional edge geometry and friction-free cutting, this unique blade is paired with a lightweight, injection-molded fiberglass-reinforced-nylon (FRN) handle. A sturdy back lock mechanism contained within the handle locks the blade securely in place when open and is easily released with either hand.